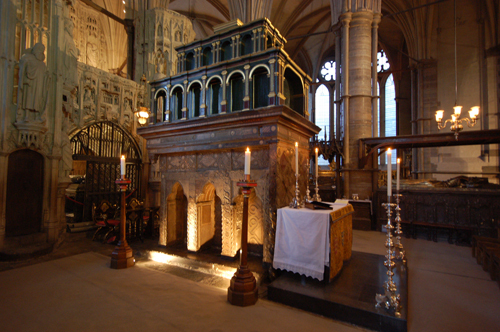 Edward the Confessor was the last Anglo-Saxon king who could trace his ancestry back to King Alfred the Great and King Cerdic of Wessex. He was the great-great-great-great grandson of Alfred and he died childless, leaving England open to conquest from overseas. Edward’s father was Aethelred the Unready, the hapless king who was besieged by the Vikings on all coasts. In 1002, he was widowed and contracted a marriage with Emma, the sister of Richard, Duke of Normandy. Edward was born at Islip in Oxfordshire within the first two years of his parents wedding. Edward’s mother was a formidable woman but his father was not someone he could look up to and he may even have been ashamed of him. Aethelred was in an impossible situation with all the attacks and when Edward was about ten, his father was deposed and the whole family had to go into exile under the protection of Edward’s uncle in Normandy. Significantly valued this kind of plenty of with this amazing new web site. I am just remarkably started to be able to show it for you to any individual. This tends to make myself so satisfied your immense understanding and know-how get yet another channel pertaining to seeking in the earth. Hi there, simply turned into aware of your weblog via Google, and found that it’s truly informative. I am going to watch out for brussels. I will appreciate for those who continue this in future. Numerous people will likely be benefited from your writing. Cheers! Previous PostOn my way home. Next PostBack on Track… I think.